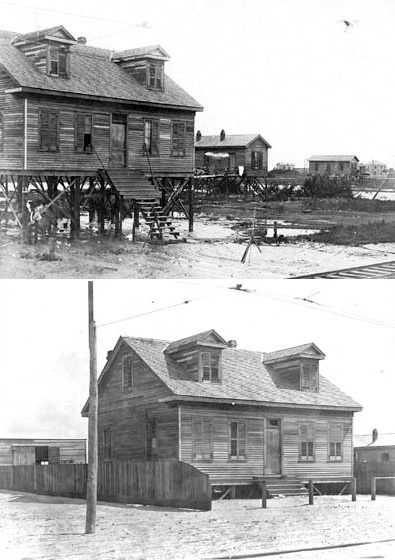 In her amazing book Against the Tide: The Battle for America's Beaches, Cornelia Dean recounts all too briefly what Galvestonians did to their city after the hurricane of 1900, which killed nearly 6,000 people and reduced what was then considered “the center of commerce for the entire Southwest” into a mountain of driftwood. Rather than retreating from the shifting sands to higher elevations, perhaps on the Texas mainland, we read that the city decided to remain where it stood and build a seawall to fence itself off from future disasters. More incredibly, it then raised everything behind the wall — houses, churches, offices, trees, gardens — by as much as 17 feet, and the revealed negative stratum was flooded with silt. The lifting operation was one of sheer brawn. 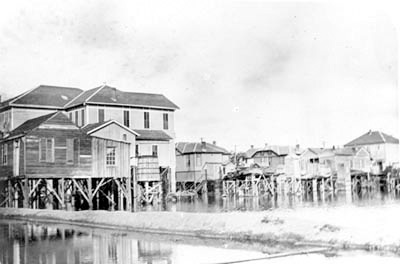 Laborers ran beams under the buildings and mounted them on screwjacks that burly men turned by hand. In this way, 2,156 buildings were laboriously hoisted, a quarter of an inch at a turn, until they reached the requisite height and new foundations could be built beneath them. Meanwhile, children climbed rickety catwalks to reach their schools; housewives hung their laundry from lines strung fifteen feet above the ground. Even substantial structures took to the air. At St. Patrick's Church, a three-hundred ton brick structure, services continued as it rose to the grunts of laborers manning two hundred screwjacks beneath it. 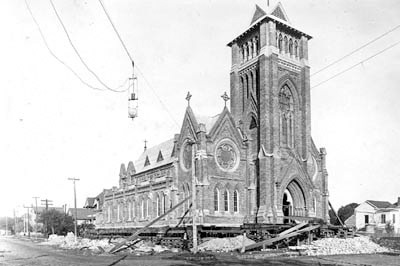 To repeat: At St. Patrick's Church, a three-hundred ton brick structure, services continued as it rose to the grunts of laborers manning two hundred screwjacks beneath it! Once airborne—a proto-Archigram city in quasi-flight—dredged fill was delivered from a canal that engineers had dug down the middle of the island. 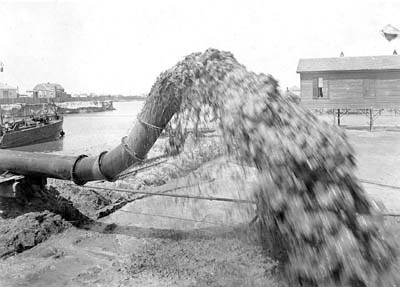 Day and night, dredges moved back and forth between Galveston Harbor and this canal, dredging up fill from the harbor bottom and spewing it out on either side of the canal in a slurry of water and sand. 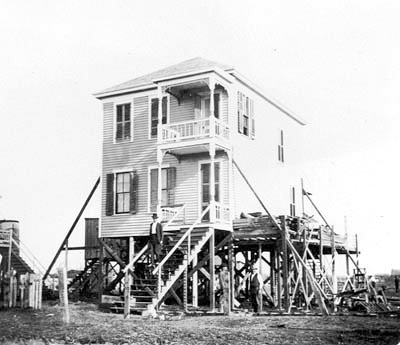 The owners of several elegant Victorian mansions declined to subject them to the rigors of the screwjack. Instead they let the pumped sand fill their first reception rooms or turned them into basements. The lawn of one graceful brick house, once surrounded by a ten-foot wrought-iron fence, is now edged by ornamental ironwork about a foot high—the top of the fence is peeking up through the surface of the fill that now surrounds it. So who wants to take a bet on when Galveston will get jacked up again? Or for that matter, when will it be done to New Orleans, Dakha, Venice, New York, and every other major cities in the world threatened by sea-level rise? You're leaving out a lot of the juicy bits... rampant yellow fever, people drowning to death in clock towers, and the impossibility of getting rid of 6000 corpses on an island-- they first tried weighting them down and dumping them into the ocean, but they broke free and washed back ashore. 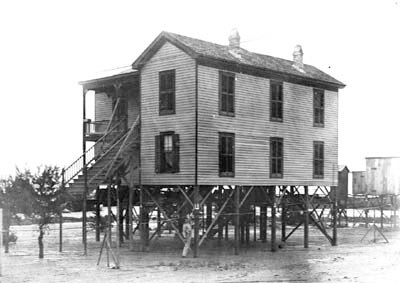 Galveston is still paying off the loan for this massive feat of engineering, and the crowds never returned for work or play. 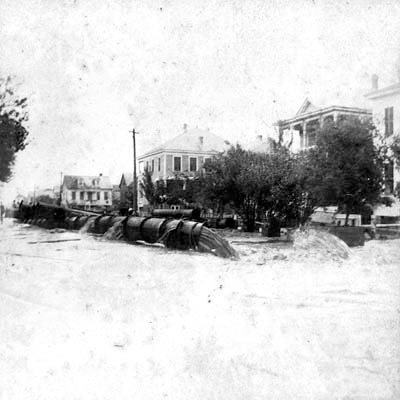 This, and the subsequent ammunition boat explosion upriver in Texas City, are the twin catastrophes that explain why the port of Houston exists-- it was just the next town up the bayou, and it managed not to blow away or explode, although parts of it did sink. And I believe that there's still only one bridge to the mainland, which gets iced-up any time freezing rain blows in. Sorry, Seattle didn't have an earthquake then; it was a fire. Galveston has 2 bridges. The causeway is the main one, and a toll bridge ($2) on the West end of the Island, plus the Bolivar Ferry. There are still tours of the Seattle underground, although Seattle is much larger now than it was at the time of the fire. The cost of the seawall and grade raising and subsequent grade raisings have all been long paid off. Thousands of people come to Galveston to enjoy the beaches and will be coming again. It is a great place to live. At 6.35 mm/yr, Galveston is measuring the highest rate of sea level rise of any long term tide gauge in the entire world. But most of that is due to local land subsidence, not global sea level change, and even at Galveston the rate of rise has been decreasing, not increasing. 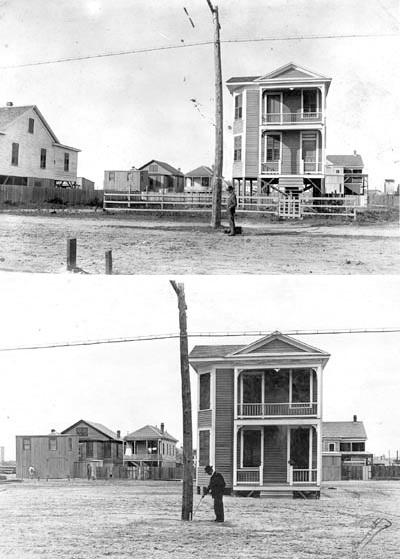 6.35 mm/yr is only 25 inches per century, so it will be a long, long time before they need to raise Galveston again.